Yes, it's one of the annoying features of Blu Ray that sometimes you need to upgrade your player firmware. In my (limited) experience it's a fairly straightforward experience, assuming you have access to a computer + internet, but it's irritating that it's necessary. So you have had blu-rays that wouldn't play until you upgraded the firmware? I'm new to blu-ray and my player is region free for DVDs. What concerns me is that this upgrade will mess all that up - I don't reallly understand the technology! Meantime I've ordered another copy of blue velvet via France which will also probably not play! So you have had blu-rays that wouldn't play until you upgraded the firmware? Yes. I don't know if they added new features or just changed the encryption but it does happen. I'm new to blu-ray and my player is region free for DVDs. What concerns me is that this upgrade will mess all that up - I don't reallly understand the technology! Me neither! Google around for your player model number - when I upgraded the firmware it didn't affect my DVD multi-region status. Thanks for your advice it is much appreciated, I'll let you know how it goes!! Heh! Well problem solved! The problem was the guy in the chair and not the BluRay player!! 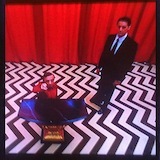 What I didn't factor in was that it was a disk created by Lynch so it works in an odd way! Never before have I had a DVD or BluRay which delivers a No Access sign when you press the button on your remote for the disc menu and instead delivers a pop up menu via the Up Arrow button, whilst the movie is actually playing!! And i have hgundreds of DVDs and a dozen Blurays. The important thing is that at last I sdaw the newly discovered screnes and there are many classic Lynchian moments. My favorite scene is the one in the Slow Club with the dog eating its dinner on stage followed by the terrible comedian and his backing band. One of the funniest scenes I've ever seen by Lynch or indeed anyone else, I was rolling on the floor! Has the bluray with the deleted scenes been released in the US? Ross wrote: Has the bluray with the deleted scenes been released in the US? This is now out in the UK as an Amazon exclusive. I stumbled on it by mistake - it's not been highly publicised. I got my copy the other day but don't know when I'll get round to watching it. Murray wrote: This is now out in the UK as an Amazon exclusive. I stumbled on it by mistake - it's not been highly publicised. I got my copy the other day but don't know when I'll get round to watching it. Thanks for the info. Had no idea it was available. Now on my Christmas list! So I am finally upgrading all my Lynch DVD's to Blu-ray. Is this version of Blue Velvet the best one out there? This is the one I should get? marchug wrote: So I am finally upgrading all my Lynch DVD's to Blu-ray. Is this version of Blue Velvet the best one out there? This is the one I should get? Thanks Mr Reindeer! Somehow I am just seeing this now.